Back Row (L to R): Tom Whelan, Alan Tobin, Brendan Walsh, Eoin Brackett, Diarmuid O'Hare, Seán O'Hare, John Kindregan, John O'Driscoll, Stephen Lanigan, Mark Fives, Mark Gorman, Richie Ryan, Joey Mullen, Neil Moore, Pakie Hurney. 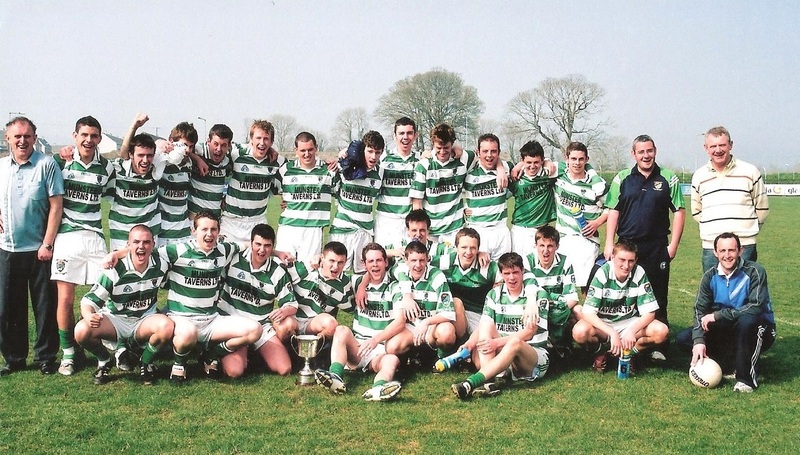 Front Row (L to R): Anthony Whelan, Alan Deegan, Brian Scanlon, James O'Mahony, John Gorman, Tiernan Murray, Mark Ferncombe, Stephen Enright, Patrick Hurney, Donal Henley, Shane Delahunty, Damien Cliffe. 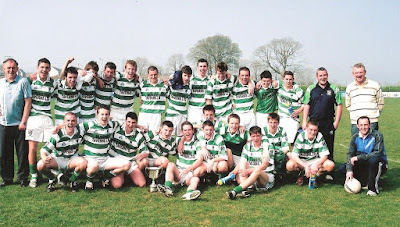 This week's photo comes from 2007 and shows the Ballinacourty U21 Football team and mentors that captured the Western 'A' title with a 3-10 to 1-11 victory over Stradbally in Fraher Field. This win completed a three-in-a-row of divisional titles and was followed later by the County title, secured by beating De La Salle also at Fraher Field.